For decades, the secret world of spies has intrigued adults and kids alike, fueled by movies and mystery books. It's no surprise, then, that many kids ask for a mystery party when their birthdays roll around. Here are some fun ways to carry out a spy or mystery theme and give your birthday kid an unforgettable party. To make your own mystery party invitations, roll your child's thumb in black ink and then press it on a piece of white paper. Scan the fingerprint into your computer, enlarge it and then use it as the image on the front of the invitations with a message like, "Make your mark at Sam's spy birthday party." Insert the cards in manila envelopes with the words "top secret" or "confidential" stamped on the back. For another fun wrinkle, print the invitations backward so guests have to hold them up to a mirror to read them. For a color scheme, think about the hues of the night, like black, gray, brown, and silver. Instead of streamers, you could hang crime-scene investigation tape. Place an open briefcase on the food table and fill it with jars holding snacks or paper plates and napkins. For a budget-friendly, do-it-yourself decoration, place black butcher paper on a wall, have your child stand against the paper in a running position. Trace around your child with chalk, and then cut it out. Make several of these silhouettes and hang them around the house. As the kids arrive, have spy-themed music playing, like the songs from "Mission Impossible," James Bond movies, and "Secret Agent Man." 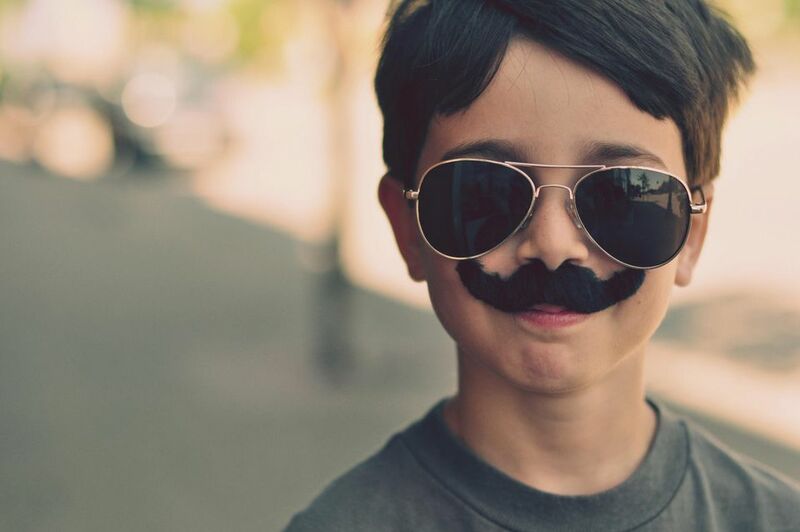 Instead of generic goodie bags, make each child a spy kit complete with a small notepad, a pencil, dark sunglasses, Groucho-style disguise glasses, a magnifying glass, and lie detector cards that supposedly determine if you're telling the truth based on the temperature of your thumb. You could add trick candy, such as Pop Rocks, to the bag. As the guests arrive, dress them in their spy gear if they aren't already wearing costumes. You could provide each child with a black plastic fedora-style hat and a fake mustache. Now it's time to have some fun. Here are some activities you could organize. Buy a large poster, such as a movie poster for "The Spy Next Door" or "Spy Kids." Cut the poster into puzzle-like pieces and give each child one or more pieces. As a group, they must put the poster back together again. Cut bigger pieces for younger children and smaller pieces for older kids. Hang a curtain in a doorway. On the hidden side, place a table and set up several bowls with mystery objects inside. On the side where everyone else is sitting, have the kids take turns putting their hand through the curtain, touching the mystery objects and writing down their guesses for what they actually were. You will need an adult on the hidden side holding out the bowls for the player to feel in the correct order. Once everyone has had a turn, find out which child had the most correct answers. Some particularly creepy objects you could use include cold, oily, cooked spaghetti (to mimic worms); peeled grapes (eyeballs); silk from some ears of corn (hair); dried apricot (tongue or ear); peeled whole tomato (heart); cauliflower steamed until soft and covered with oil (brain). Put your spies' physical skills to the test with an obstacle course. Set up a race that might include walking on balance beams; carrying an egg across a certain distance on a spoon; holding a baseball bat to the forehead, pressing the bat into the ground and spinning around it three times; or crawling under a mini trampoline. String yarn or ribbon across a room in a web pattern, imitating laser beams surrounding a prized object. One at a time, the kids will try to weave through the laser beams to grab the prize and come out the other side without touching a laser beam. If successful, the child gets to keep the prize. Time each run and the successful player with the shortest time wins a grand prize. Cover the floor of a room with black balloons that you've filled with regular air, not helium. Inside one balloon, insert lots of red confetti before you blow it up. Tell the kids they must pop all the "bombs" and the player who happens to pop the "real bomb" (the one filled with confetti) wins. Each child must tell the group two truths and one lie about himself. The rest of the kids have to guess which information was true and which was false. Give the kids some time to think up truths that seem impossible and lies that don't. The player who's able to fool the most friends wins. You could also center the party around making spy crafts, such as toilet paper roll binoculars, pretend cameras, and egg carton eye mask disguises. Don't just let them have their cake and eat it, too. This is a spy party, after all. Make them think about it. Hide the cake before the party begins. Soon enough, kids will start asking where it might be. Send them on a secret mission deciphering secret clues that lead to the cake. Seal the clues in manila envelopes stamped "Top Secret" or "Confidential." Now it's time for cake, young ones. But where is the cake, you might ask. You must find it, find it fast. the room where the birthday boy (or girl) rests his (or her) head." The kids then scramble to the birthday kid's bedroom and find the next clue. You could hide the envelope and make them find it, but be warned that that might lead to a rowdy ransacking of the room. If you want them to find it quickly, the envelope could be tied to a helium-filled balloon. "Nice work, young spies. You found this clue. I'm sure you know the next thing to do. a place where, during summer, there isn't a care. This clue is hidden in a place where we sit." The kids then rush outside to the lawn chairs and find the next clue. The clues continue as long as you'd like. Just before they reach the final one, take the cake out of hiding and place it in plain sight in the dining room. It might be tempting to hide it under a box or in some other sneaky spot, but consider how rowdy the kids might be by now. You don't want a group of kids rushing to uncover the cake—and perhaps sliding into it. "You've all worked hard, you've put up a good fight. Let's get to that cake now. Let's all take a bite. The cake is now sitting in a room where we eat. No, not the kitchen, the room with the seats. If you'd rather not hide the cake, make the mission to find the big gift you're giving, such as a new bicycle. Mystery missions are fun to coordinate, but if you'd rather have someone else do the prep work consider buying a pre-packaged mystery party kit, like the ones sold by companies such as American Girl. So what should that cake look like? It could be shaped like a trench coat, magnifying glass, a question mark, a large fingerprint with swirled icing on top, or even a round black bomb with a sparkler "fuse" on top. You could also make crime-scene investigation tape out of yellow and black fondant and drape it across a cake. Or have a bakery airbrush the silhouette of a shadowy figure carrying a briefcase. To get the same look at home, cut the shape out from black rolled fondant. That same spy could creep across a book-shaped cake to emphasize spy books rather than movies. If the birthday kid is a James Bond fan, you could top the cake with a "007" or "009" or "010" or whatever age the child is turning. Your child's spy birthday party might be focused on a particular movie or book. In those cases, go with a cake that depicts a character or symbol from the story, like a cake celebrating Disney's action-hero dog, Bolt. If you also plan to serve savory snacks, give regular food spy-related names, like Agent Apples, Fingerprinted Fish Sticks, Undercover Onion Rings, Double Agent Dogs (two hot dogs in one bun) and Top Secret Sandwiches. Whether you plan an all-out party filled with spy-related activities or just want to put up a few decorations and pop in a movie, enjoy your mystery-minded birthday kid's big day.